On a recent trip to the public library with Tina (books are my thing) we were browsing through the new section. She oh, so casually handed me a book because the title snapped her attention to me. A book screaming out for me, she says. 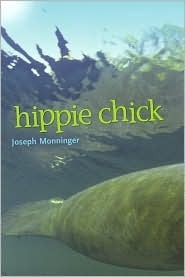 Hippie Chick by Joeseph Monninger(2008) is so much more than just a funky, catchy title-it may be the Julie of the Wolves for today. 15-year-old Lolly (short for Lollipop) Emmerson is a free-spirit, what others call; the hippie child of a hippie woman. Her favorite thing to do is sail her Boston Whaler in the Florida Keys. One night she runs into an underwater obstacle and the boat founders. After Lolly is knocked out and separated from the boat, she realizes that she's done for and accepts her own fate. That's when the manatees arrive. Hippie Chick is the story of a girl who forges a bond with these amazing creatures that defies the facile explanations others try to impose. It is a story of survival and enlightenment. Lolly was an easy character to love and admire. She's hippie with out being over the top or preachy. I especially enjoyed the debate she had with herself about how to stay vegan while foraging for food near a tropical inlet. She takes her cue from the beautiful manatees and dives under and eats the greens; like a giant underwater salad. Yum, Yum! Monninger's lastest book is Eternal on the Water and he's written several others-I plan to read more of his collection.